The family of A3-Lite Sensor Kit’s can be used in static applications (A3-LS) to measure bending forces and in dynamic applications (A3-LD) on any ferro-magnetic objects. The A3-Lite can be applied to limitless applications and onto different Test-Objects of almost all sizes (*) as this is a contactless measurement principle (the Sensing Module is reusable). 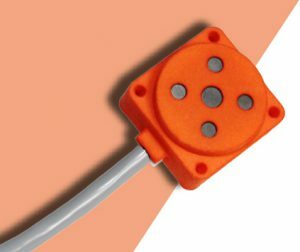 The A3-Lite Sensor Kit consists of two items (the Sensing Module and the Sensor Interface Box) that are connected by a 1.5-meter cable with each other. Using a simple but reliable “clamp” or “fixture” the A3-LS Sensing Module can be mounted directly onto a non-moving Test-Object. 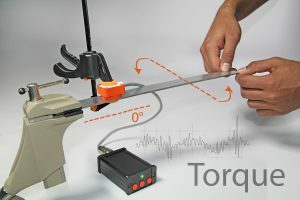 The user can then detect and measure changes in the mechanical stresses that are applied to the Test-Object (like Bending or Torque forces). Depending on the stiffness and size of the Test-Object the user may want to calibrate the measurement equipment. The A3-Lite “D” Sensor Kit is a factory calibrated Torque Sensor System and is already mounted onto a 25 mm diameter and free rotating shaft. The recommended Full-Scale (FS) Torque measurement range is +/-125 Nm. The user has the option to remove the Sensing Module from the provided fixture and then use it as a A3-LS Sensor for static measurements on different Ferro-magnetic objects. The A3-Lite Kits are powered by an external DC power supply (+7.5 Volt min to +24 Volt max) and provides an analog signal output on a built-in BNC connector. The analog output voltage is proportional to the applied mechanical stresses to the Ferro-magnetic Test-Object. The optimal measurement range for the A3-Lite Sensor Kit is +/-40 MPa (Mega Pascale) and the output signal update rate is 100 measurements per second. The Active-3 Lite Sensors take measurements from Test-Objects that are coated in any paint or are slightly rusty. The measurement principle will not age or be harmed when overstressing the Test-Object. There is no need for any kind of treatment of the Test-Object: This is a true plug-and-play measurement system. 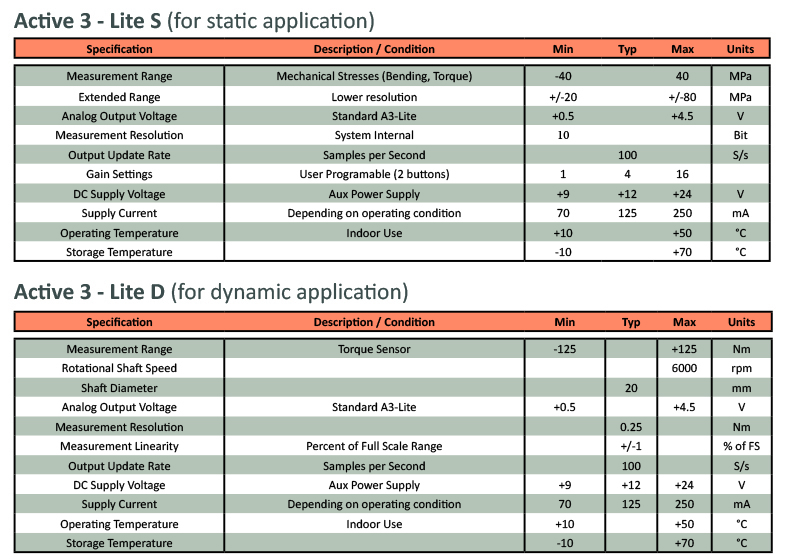 Non-Contact Sensors for static (A3-LS) and dynamic (A3-LD) applications. 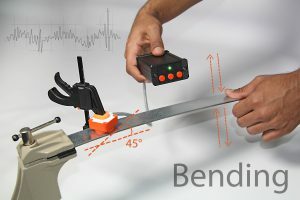 Ideal to measure Bending and Torque Forces on static objects: A3-Lite “S”. Also, available as a factory calibrated Torque Sensor System: A3-Lite “D”. Provided with 25 mm diameter shaft; max shaft rotation 6000 rpm. Works on any Ferro-magnetic objects (beam, shaft, tubes, rod). Wide measurement range: -40 MPa to +40 MPa. User programable signal gain: Factor 1, 2, 4, 8 or 16. A3-LD is already calibrated for +/-125 Nm Torque Range. Output Offset “zeroing” through push button (zero = +2.5 Volt output). Analog output signal: 0 to 5 Volt.